British Columbia’s Kootenay Rockies is home to the POWDER HIGHWAY®, where deep snow, funky towns, and some of the most downhome, stash-laden, adventure-packed ski resorts in North America exist. This legendary place offers an abundance of deep Kootenay powder melded with authentic ski towns, full of vibrant locals. Throw in some of the world’s most renowned heli-skiing and cat-skiing operations, as well as highly-coveted backcountry lodges and this area of British Columbia stands out as one of the premier ski destinations. Consistent snowfall, deep powder and celebrated ranges like the Rockies, Monashees, Selkirks, and Purcells, all accessed from scenic towns like Fernie, Nelson, Rossland, Golden, Revelstoke, Invermere, and Kimberley, make the region a must-visit for winter sport enthusiasts. And it doesn’t matter where you start your journey. Maybe in Revelstoke, where people have been skiing for 100 years, or Nelson, where snow buries charming heritage houses, or Golden, where mountains scratch crystal blue skies. Or perhaps your journey begins down in Rossland, up at Panorama or over in Fernie, where steep trees, ‘cold smoke’ and storybook villages have captured the hearts of enthusiasts. Once here, one highway connects many ski and snowboard adventures. But don’t fret, there’s no rush. The perfect snow, spectacular mountains and friendly people will wait. On the Powder Highway, there’s plenty to go around. The Powder Highway, is your road to winter. Professional skier and full-time road tripper Dave Treadway tells us why the Powder Highway, in the southeast corner of British Columbia, should be at the top of your winter playtime destination list. The Powder Highway is a circular route through the Kootenay Rockies that passes by 8 alpine ski resorts, over 20 backcountry lodges, and numerous heli- and cat-ski operators. Not to mention the awesome little towns with unique local cultures all to themselves. The best advice Dave has for planning your trip? Take the time you’ve allotted and double it…and have a blast! The region showcases eight alpine resorts. Fairmont Hot Springs Resort ski area offers everything for a great day on the slopes. With soft snow, 14 runs, two terrain parks and a tube park, there is an adventure for everyone. Enjoy the uncrowded trails, fast-moving lift lines, panoramic views of the Columbia Valley and the rugged Rocky Mountains. To complete your day, the very best apres ski is here. Nothing matches an exhilarating day on the slopes more than a soothing soak in Canada’s largest natural mineral hot springs, which is included with each lift ticket. This is a unique Powder Highway experience you don’t want to miss. 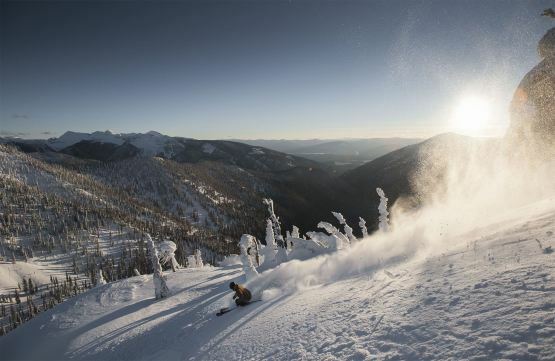 Located in Rossland, RED delivers 2,877 acres of pristine, unfettered skiing. And, with the expansion to Grey Mountain, this added nearly 1,000 acres of terrain to the equation, bumping RED into the ‘Top 20’ – size-wise in North America. With 7.6 metres (25 feet) of annual snowfall, inbounds cat-skiing, the brand new Josie Hotel and Get Lost Adventure Centre, it is no wonder the NY Times voted RED their #8 Best Place in the World to Visit in 2008. Also voted the Most Underrated Resort by Skiing in 2012. Fresh turns you don’t have to fight for – that’s RED. Located just outside of the funky and vibrant city of Nelson, it is hard to describe its true authenticity and abundance of snow. Over 12 m (40 ft) of snow falls each season on 2,044 vertical feet of uncrowded slopes of family-friendly groomers and bumps, remarkable steeps, top-of-the-line tree-skiing and endless backcountry. This year marks a new chapter for this legendary resort with a number of upgrades and an expanded Glory Lodge. A key part of the resort’s experience is the legendary food. Whitewater serves up proper Kootenay hospitality with its internationally acclaimed menu. Whitewater is best described by its tagline. Pure, simple and real … DEEP. Fernie Alpine Resort receives an average of 9 m (30 ft) of legendary powder snow each season and attracts a wide range of skiers and riders from around the globe. With over 2,500 acres of skiable terrain, 107 runs, 5 alpine bowls, state-of-the-art snowmaking and grooming equipment, and an exceptional beginner’s area, Fernie is a true winter playground. Discover what a great winter vacation to the Canadian Rockies is all about – huge alpine bowls and uncrowded trails. With a mild but snowfall-heavy climate, the weather won’t send many chills down your spine, but the scenery and incredible skiing will. Located in the heart of the Powder Highway, Panorama Mountain Resort lives up to its name. Surrounded by the towering peaks of the Canadian Rockies, endless vistas of snow covered summits stretch as far as your eyes can see. This place is Pure Canada. Where the best of creature comforts are bordered by stunning wilderness and a vast 2,975 acres of patrolled, skiable terrain – from beginner-perfect groomed trails to wide rolling cruisers, to the steep and deep exhilaration of Taynton Bowl to the rush of heli-skiing – all right from Panorama’s intimate and family-friendly ski-in / ski-out village. Home of Canada’s largest slopeside hot pools. Known as the ‘Champagne Powder Capital of Canada’ with more than 2,800 acres of skiable terrain, 121 runs, four alpine bowls, 85 chutes and 1,260 m (4,133 ft) of vertical – the fourth highest in North America. The resort also offers 5 lifts including the high-speed, eight passenger Golden Eagle Express Gondola. The winter season is complete with a tubing park, skating rink and numerous restaurants – including the Eagle’s Eye Restaurant (with overnight accommodation), located at the top of the Gondola and is Canada’s highest elevated dining experience. Stay overnight and log in the most epic first tracks imaginable. Revelstoke Mountain Resort is Canada’s newest ski resort, celebrating its 10th Anniversary this season. With 1,713 m (5,620 ft) – the longest lift accessed vertical of any resort in North America, 3,121 acres of terrain and about 10 m (30-40 ft) of snow annually, it is a big mountain enthusiast’s dream come true. At over 15 km (9 mi) in length, the resort also boasts the longest ski run in North America. If you want to challenge yourself with unbelievably long fall line groomers or deep snow, and if off-piste, tree skiing sounds appealing to you, Revelstoke Mountain Resort is the place to ski. Small town charm combined with sunny days and reliable snow conditions – light, fluffy, ‘Purcell’ powder and nearly no lift lineups – you can log powder filled run after run at this wonderful resort. And, if the prospect of skiing under the stars intrigues you, Kimberley Alpine Resort has one of North America’s longest illuminated runs. Perfect for families, the mountain offers everything from wide-open groomed runs, powder stashes, adventurous steeps and beautiful views in a friendly, downhome atmosphere. There’s lots of apres ski at the Stemwinder Bar and Buckhorn & Main Restaurant. Discover more at the Kimberley Alpine Resort – explore with a backcountry trip with Boulder Hut Adventures. Ride up the mountain in the warmth of a heated snowcat or land on mountain peaks by helicopter and make fresh tracks in bottomless powder. * Also offer Day Cat-Ski Trips. There’s endless options for track-set skiing from luxury fly-in retreats to rustic lodge to lodge ski touring. The Kootenay Rockies Powder Highway – an adventure-filled highway-to-heaven that’s peppered with world-class ski resorts – is more than just the epic skiing and boarding. Snowshoeing, fat biking, dog sledding and snowmobiling are just the tip of the iceberg when it comes to off-piste activities! The Kootenay Rockies has the highest concentration of winter experiences in the world. "SUPER NATURAL BRITISH COLUMBIA" and all associated logos/trademarks are trademarks or official marks of Destination BC Corp.